I finished my signal flag quilt! I am very excited to have this quilt finished for my guild’s exhibit–a first for me. The exhibit opens November 4. I still need to add a sleeve, but thanks to Vanessa I know how. We are so lucky to have Vanessa Vargas Wilson as the leader of our guild. Vanessa (aka Crafty Gemini) is a total dynamo and a wonderful teacher. In fact, before I ever met Vanessa I used her tutorial about hands stitching binding. I was having trouble with my corners–they were lumpy and crooked–not pretty! Vanessa’s video tutorial walks you through the process so clearly and you get a sense of her sparkling personality. Here you can see my tidy binding–thanks Vanessa! This quilt measures 41 x 52 inches. I used all Kona solids for the front and an organic print of the back. I added a small tag in the binding–it’s a really small way to identify the quilt as mine. This entry was posted in Modern Quilt Guild, quilts and tagged baby quilt, crafty gemini, how to sew binding, modern quilt, quilt tutorial on October 25, 2013 by brigitdermott. Love it! 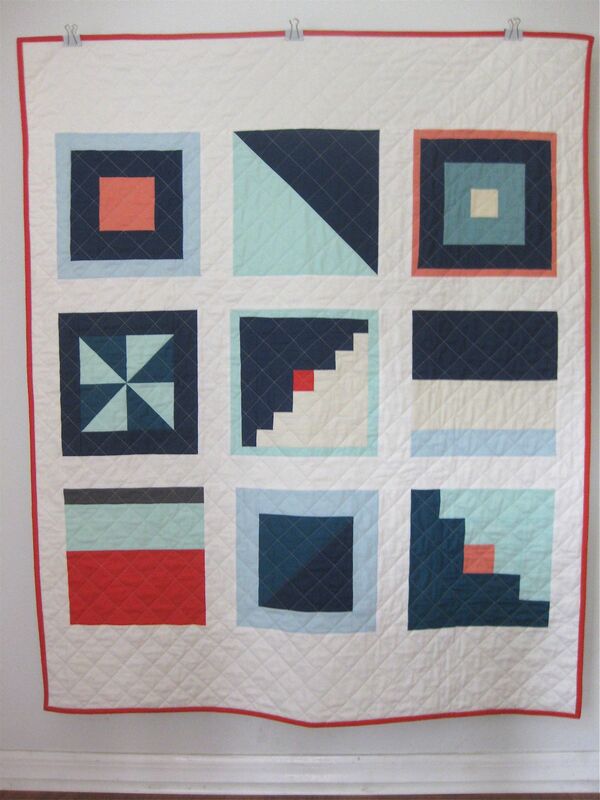 The quilting makes the blocks pop! How wonderful that you will be having this beauty displayed! 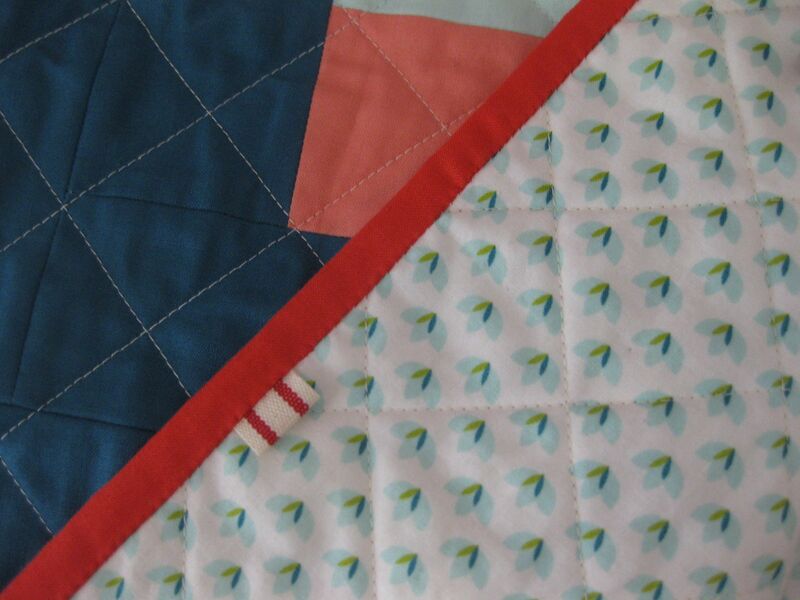 Your quilting is so perfect….how do you do it? Thanks, Vicki! I mark the top with a long metal ruler, making lines from edge to edge spaced the width of the ruler. In this case, I used the diagonal lines in the blocks to mark some of the lines. 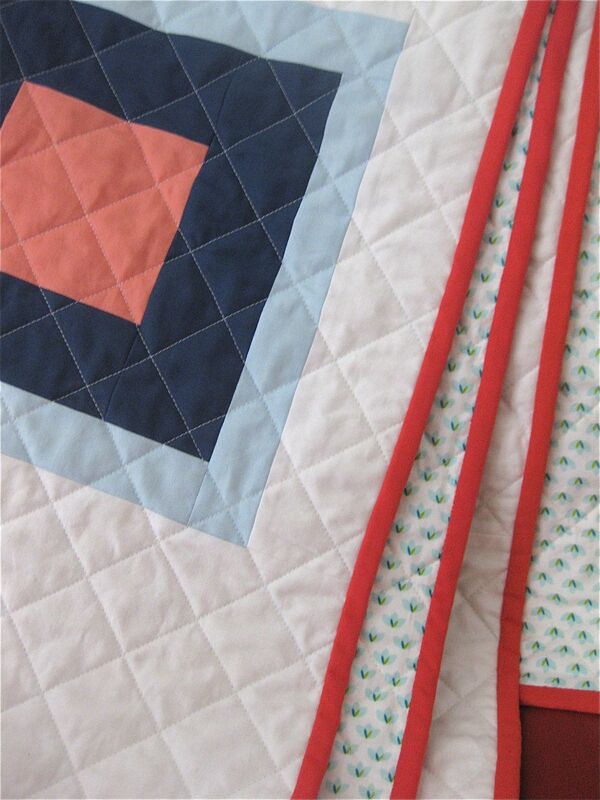 I really like straight line quilting on the diagonal because it gives a really smooth finish–no puckers! Gorgeous! Great colors, great design. Gorgeous! A work of art. Congratulations on a finish, love your tiny tag in the binding!